Clue meets Dixit in this challenging cooperative board game. “The creepy-looking magician guy, in the study, with the fork.” This is how a successful game of Mysterium ends – with a group of psychics figuring out who done it, where, and with what. And yes, “fork” is definitely an option. 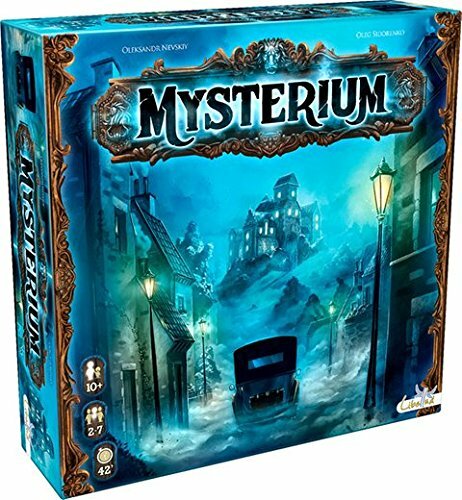 Most players at the table for a game of Mysterium are psychics, trying to divine clues provided by one other player, who happens to be a ghost. This ghost was murdered and it’s up to the psychics to figure out by whom and how. It won’t be that easy, however. The ghost can’t talk and instead can merely provide visual impressions to the psychics. The ghost hands cards featuring beautiful but abstract art to the various psychics, trying to lead them to select the correct suspects from a half-dozen or so possibilities. Each psychic has their own set of suspect, location, and weapon to identify and only the ghost knows the truth. One of the location cards in Mysterium. Playing the ghost in Mysterium is sort of like being trapped in a tragic comedy. The cards you draw almost never have any reasonable connection to the suspects and it’s impossible to ensure the psychics focus on the aspect of the clue that matters. And you just have to sit in silence and suffer through it. While there’s a certain torture to playing the ghost, it’s satisfying when you manage to lead the others to the proper suspect with totally abstract clues. And there tends to be a reckoning after the game, where the ghost explains how each clue tied to the correct cards. As a psychic, you have pressure to not be the one to cause everyone else to lose. All psychics need to collect all three of their cards (suspect, location, weapon) or everyone loses. Everyone can discuss the clues you’re given and sometimes your gut reaction is overruled by incorrect interpretations from your teammates. As long as you don’t take Mysterium seriously, no one’s going to end a friendship over incorrect guesses. And if anyone does, get some new friends. Yours are dicks. What's in the box?! Here's Mysterium all set up. Mysterium is the marriage of Clue and Dixit. If that sounds appealing, then you’re probably going to love it. The instructions and the setup diagrams make the game seem more complex and confusing than it is. If you’re looking for a unique cooperative experience and, like me, you enjoy asymmetrical games (1 vs. many), then Mysterium’s likely to please. It will deservedly get some talk as one of the best co-op games of 2015. A different kind of co-op game. Being the ghost is not as fun as being a psychic. After a half-dozen games, you can start to connect certain clues with the correct cards every time. You want a co-op game with Dixit art. You’re looking for a co-op game that plays in under an hour (rarer than you may realize). You’re looking for a challenge.